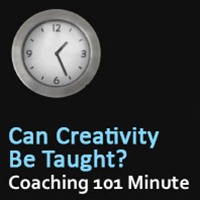 You are here: Home » RESOURCES » Coaching 101 Minute » Can Creativity Be Taught? I have never been a creative person and I’m not sure if I can be a creative coach. This is a question asked in class this week. 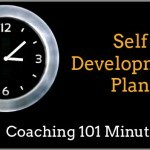 In coaching, we use creativity no matter if you are a business coach, spiritual coach or a life coach. In order to change the way that you see the world, you need to have creativity, some openness to be able to see things differently. If you are someone who values creativity, or see yourself as a creative type, you probably have unlocked the right side of your brain. There is a lot of research that’s been done looking at the two different hemispheres. The left-hand side is usually the focus that we see most of the time in culture: analytical, details, the specifics. Much of our schooling is geared towards the left-hand side of the brain…..memorization, learning things so then you can use them in the future, Whereas the right-hand side of the brain focuses on context, the big picture, most importantly, creativity. The right-hand side of the brain is the creative side of the brain. Everyone has the ability to tap into both the left and the right-hand side. There are many tests out there and assessments that can help you to determine which side is stronger..but to answer the question for the student in class this week who may not have been as much of a creative type, I want you and her to know that you can learn to be more creative. Edward de Bono specialized for many years in this idea of learning to be more creativity. He teaches beliefs there are two different areas to creativity: Idea Creativity and Artistic Creativity. Artistic creativity is usually what we think about: singing, painting, sculpture, dance, etc.. 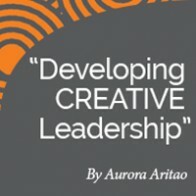 In coaching we are talking about something different, we are looking at idea creativity. We help our clients to see the world and to find possibility. It is a skill you can hone. Part of developing this skill of creativity is looking at possibilities, maybe new possibilities the client never experienced before. I want to leave you with a few simple techniques you can start doing immediately, as soon as you’re finished with this audio, try one. For this exercise, take a pencil in your right hand even if you are left-handed, and write the question, “what is going on?” Switch the pen to your left hand and write whatever pops up. Your non-dominant hand’s writing will be a little shaky, but that’s okay. The important thing is not in its tidiness, it is in noticing that the other hemisphere of your brain may have a different personality. Then flip it around, ask another question with your left hand and then answer it with your right hand. Listen to some music and draw what you hear with your left hand. Since our left hand is controlled by the right-hand side of your brain, which is the creative side of your brain, this is tapping into your creativity. Let your left hand go free; write, draw, whatever it may be inspired to do as you are listening to the music. You’ll be very surprised as to what you create. Report back to this post and let us known what your experiences was like with any one of these three different techniques. Other questions that were asked in our Coaching 101 classes this week focused on getting started as a brand new student here at ICA. What programs do you offer and what are the different graduation periods for each one of these classes? If I’m working full-time, am I able to take on classes at a pace that fits in with my schedule, or am I predetermined to a specific schedule of classes based upon the curriculum? If you’re looking into learning more about your creative mind and more about coaching in general, come along to a Coaching 101 class this coming week.